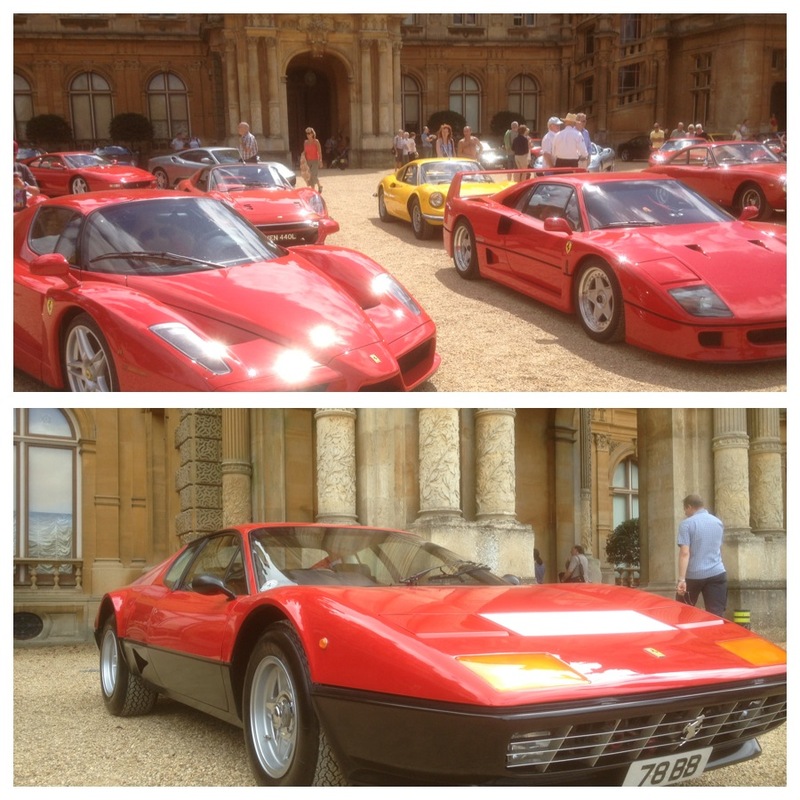 Pininfarina design and their automotive sculptures inspired me ever since I was a child. 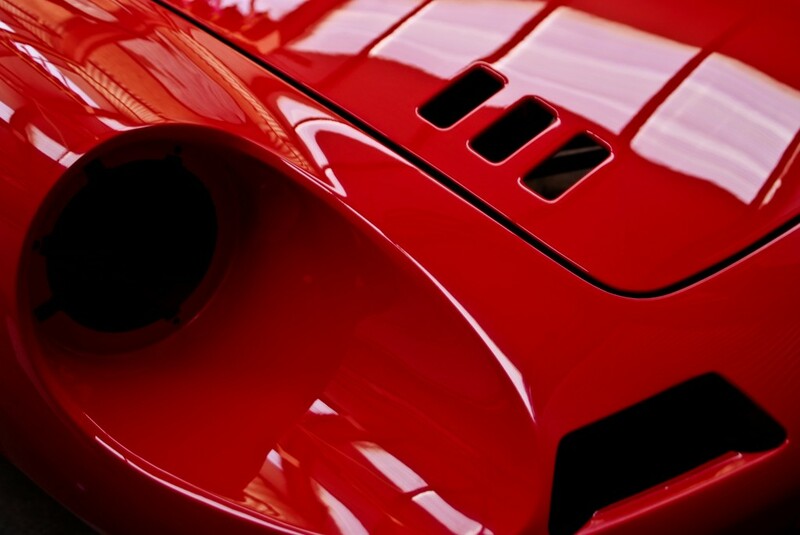 Burago models and posters of the 288 GTO, Testarossa, 308 GTB and Dino adorned my bedroom walls and lead me to my first career in Design. 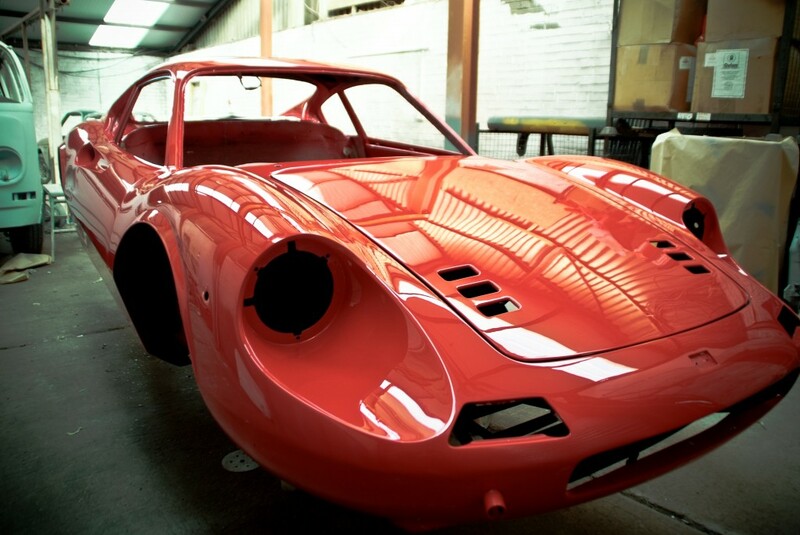 So when Templar and Wilde Classics contact The PaintShop Pros with an enquiry about painting their latest Ferrari 246 Dino I just had to do it. When the Dino was delivered to us the body condition was not quite at the stage that I thought it would be. Simon from Templar and Wilde explained the variations in body shape of the original hand produced body and the details that he has identified as the most original shapes. 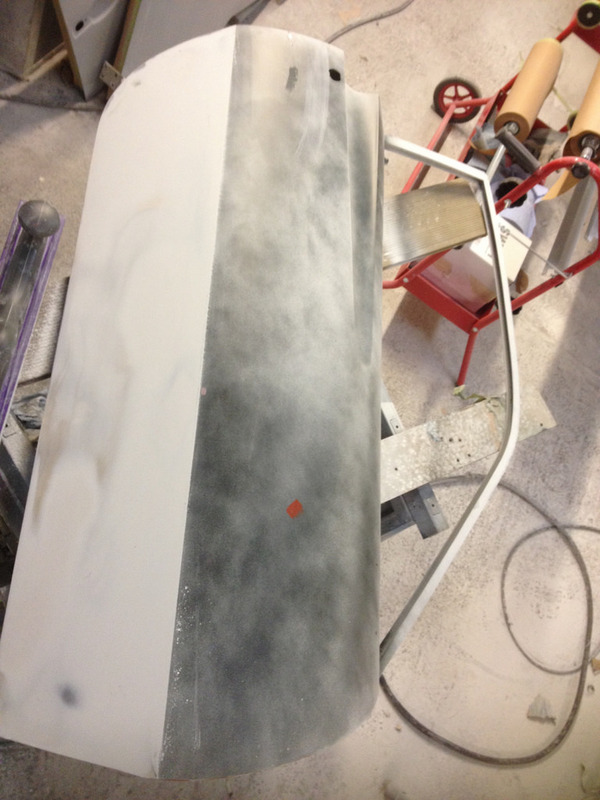 The first job was to sand the protective epoxy paint to reveal the genuine shape of the panels. 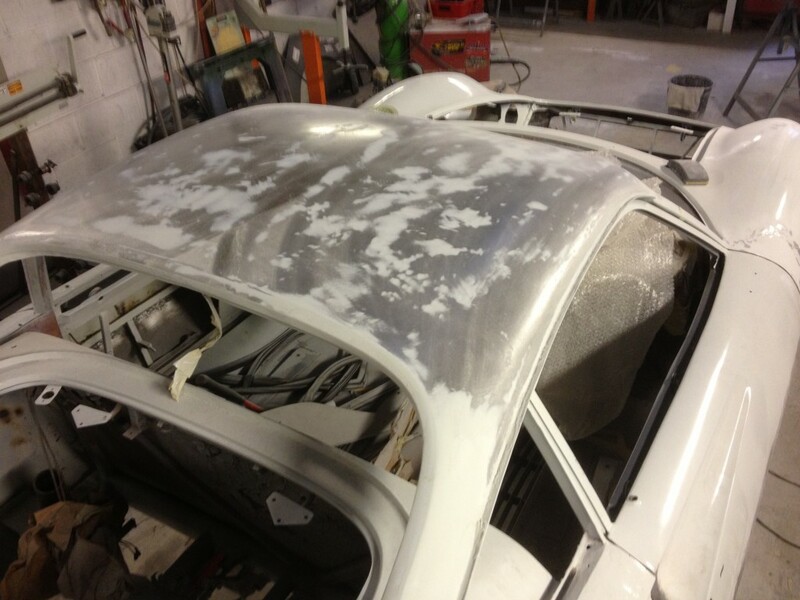 In the pictures below the grey mottled areas show the high and low areas of the metal work. The high areas are raw metal and the low are still white. 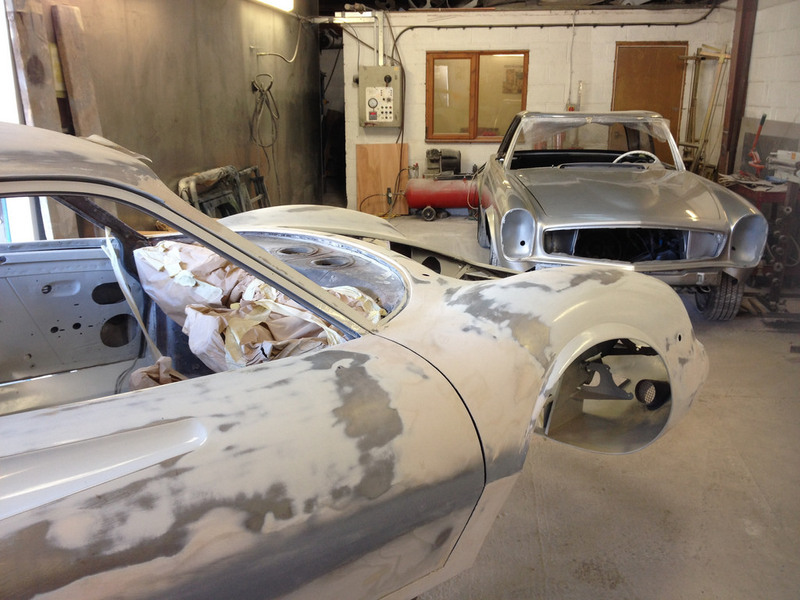 All of these needed to be averaged out as best as possible before the paint preporation could begin. The biggest shape change was needed down both sides of the car. 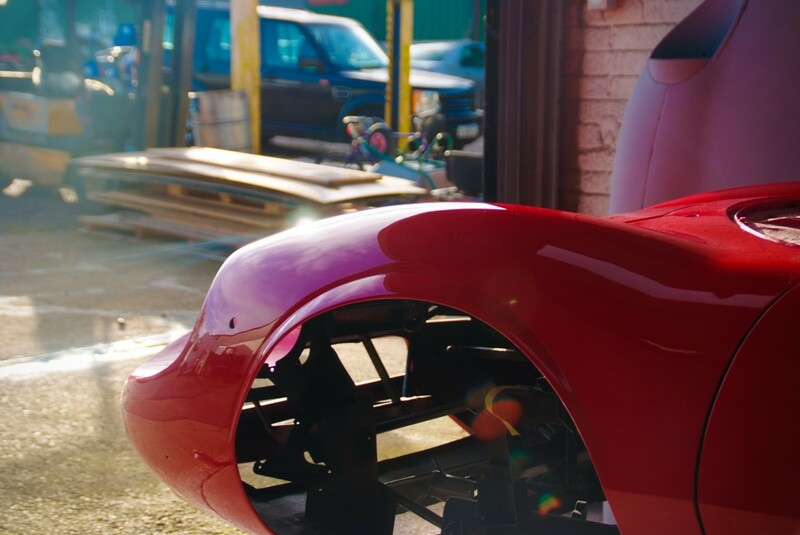 The lower panels between the front and rear wheel arch had to be flat whilst tapering approx 5mm in to the Dinos centre line in the rear quarter topped with a crisp straight, correctly postition swage line. First we pulled the panel back in towards the chassis then using combinations of panel beating, lead filling and heat shrinking we slowly straightened both sides. 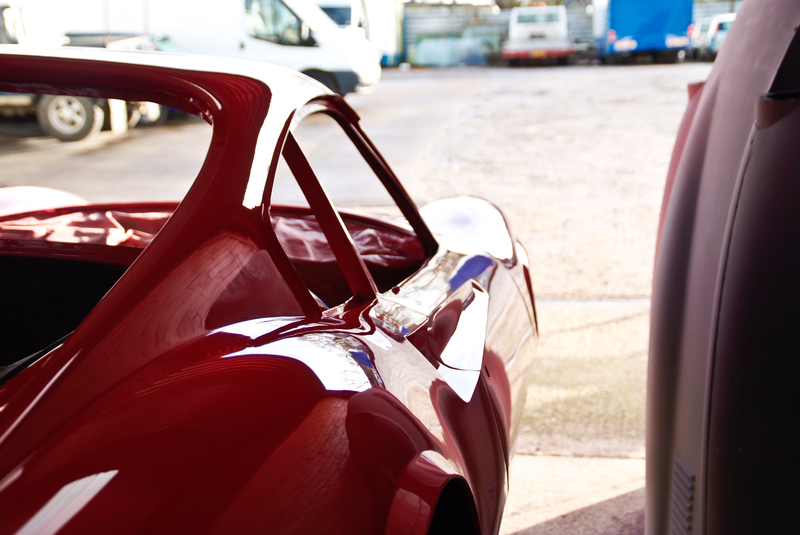 The doors where left in place as the flatness of the panel had to follow the entire side of the Ferrari. The lower sill panels and midway swage line followed. 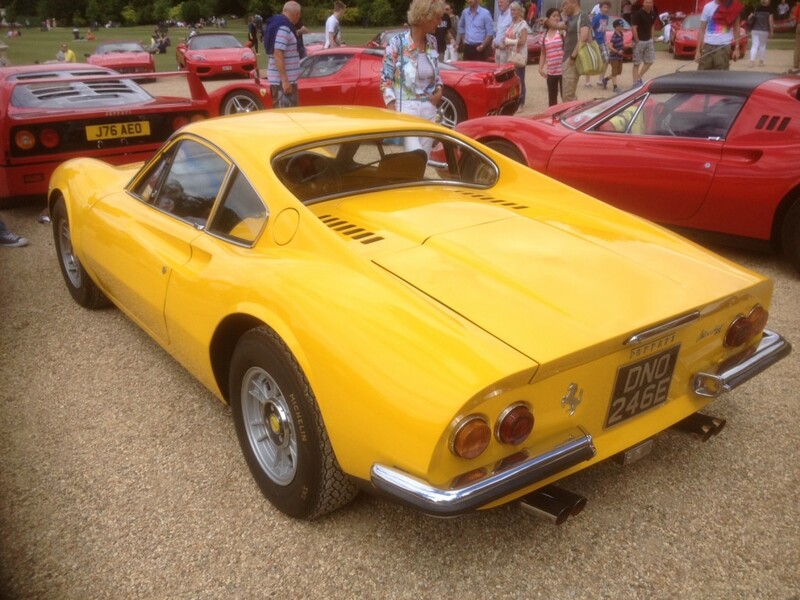 The Swage runs right round the Dino apart from the rear panel. We used a chalk line to mark the swages path and then a lot of patients to correct, emphasise, of subdue the prominence of the swage as required. using the hammer and dolly to chase the metal back to remove a flat spot on the seam of the head light bowl. 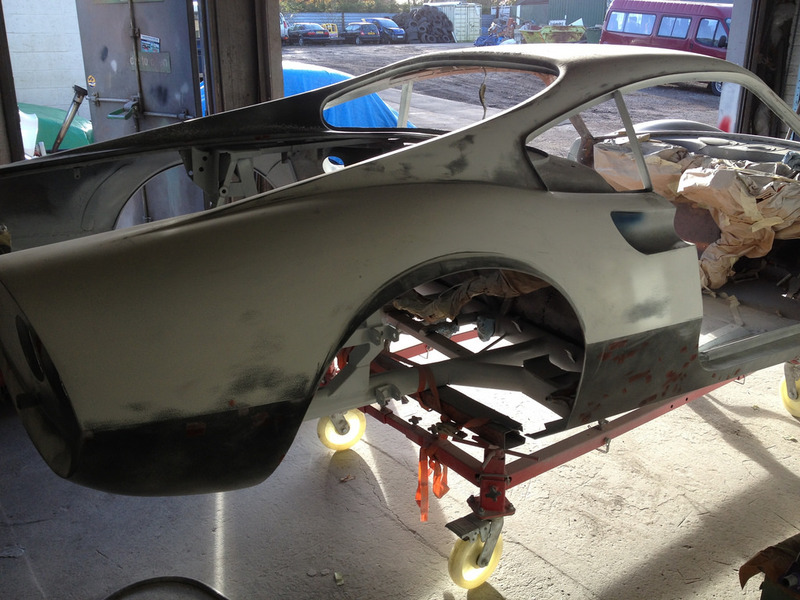 With the lower section nearly ready attention was turned to the high body sections. 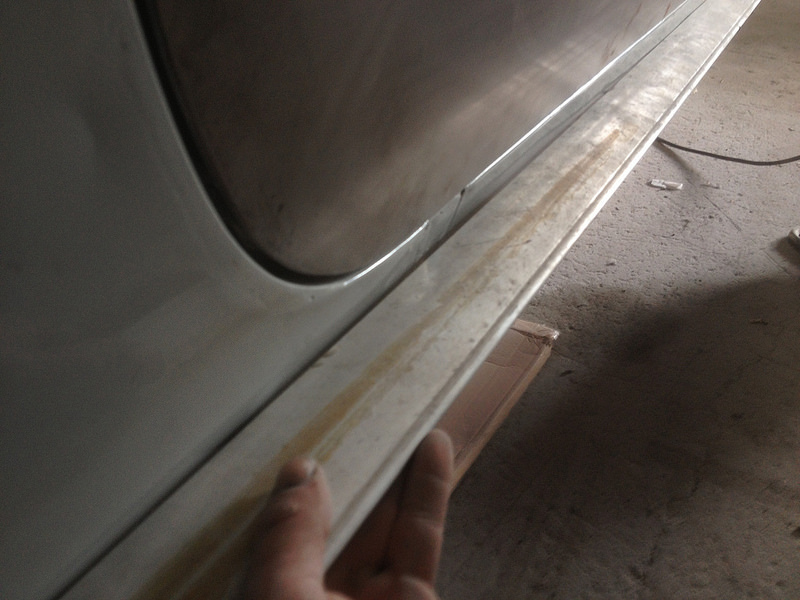 A hammer and dolly was used across the body to panel beat as many of the dents out as possible to reduce the level of filling that would be required. all the above took over a month of continuous work to complete. 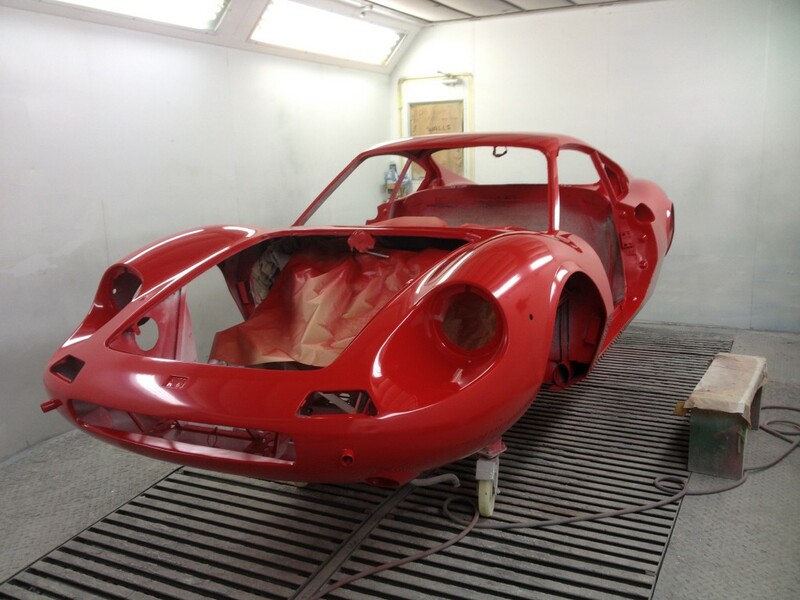 The next stage was to primer coat the Ferrari body. 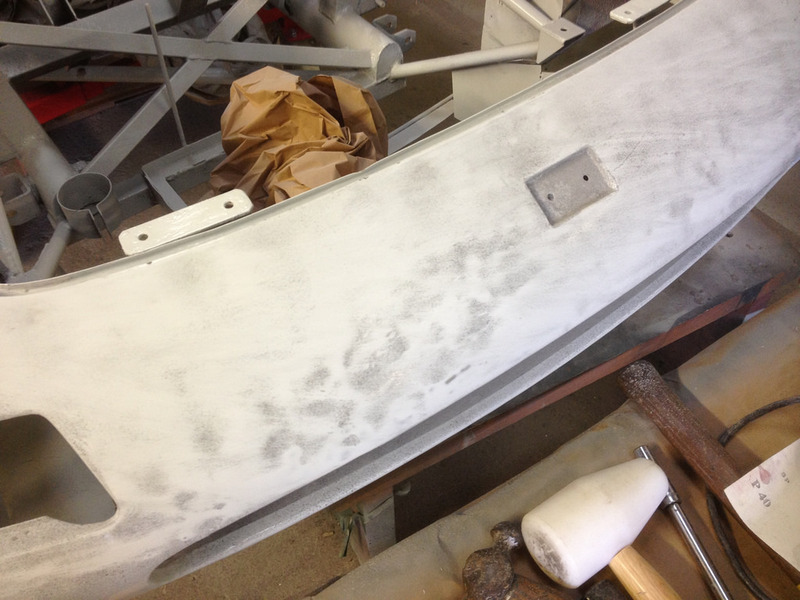 A fresh coat of primer rubbed down would reveal areas that still required attention and there where plenty of those. 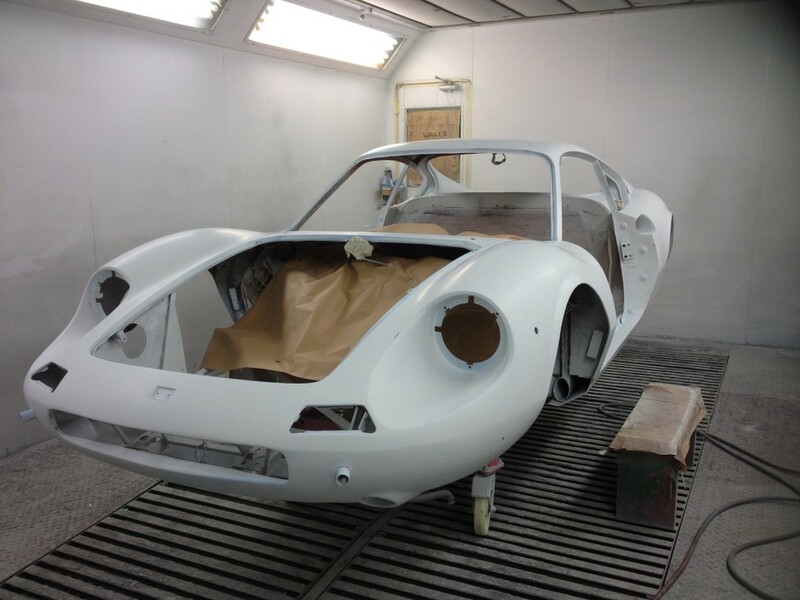 After primer coat. Black areas have guide coat, white areas have been sanded down, blemished in the white are areas that still require attention. I think the black and white design would look very retro cool – maybe on a replica Dino. Here it is easier to see the areas that need further work to level out. 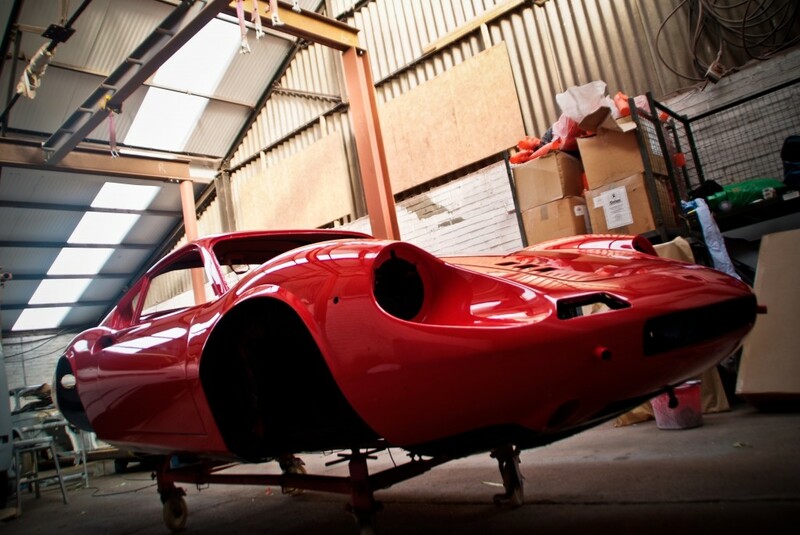 Dino has a total of 5 opening panels that all go through the same processes as the main body. 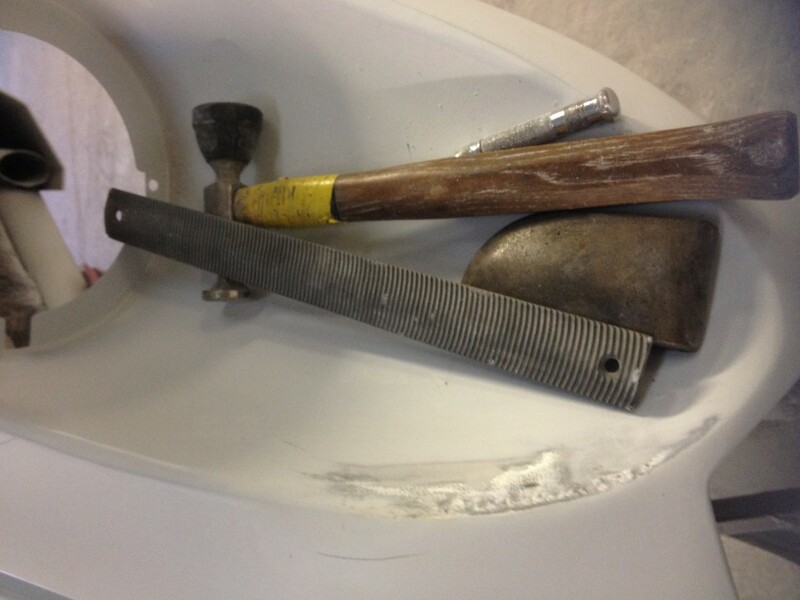 Once all these areas where dealt with the body has another priming session to double check all the details. 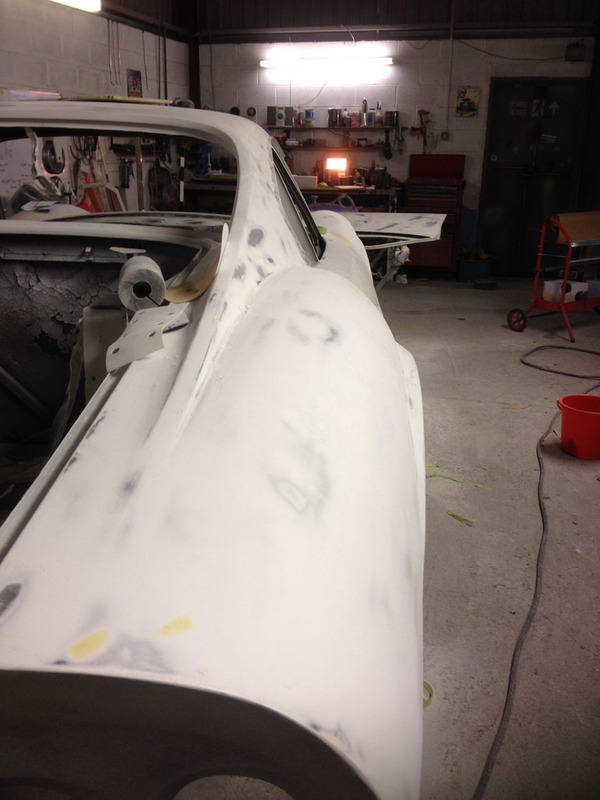 Any further imperfections are identified and reworked and primed again. 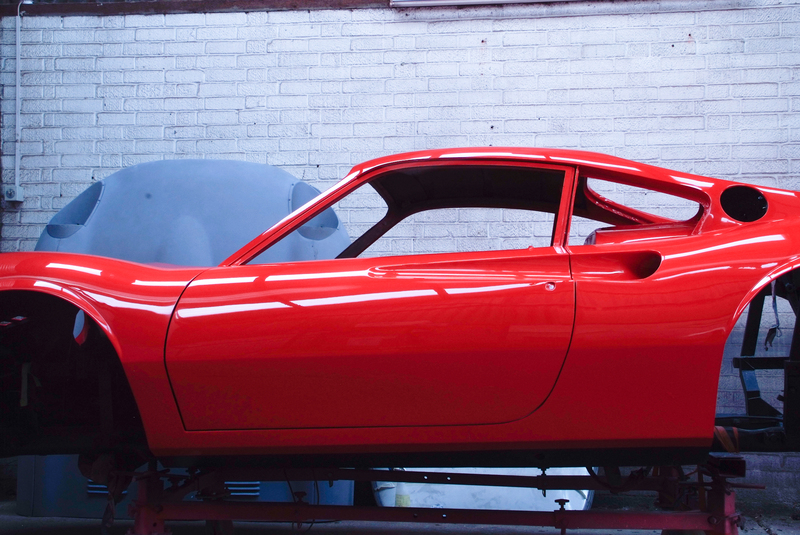 Once we are happy the car has a final prime, flat and clean before going in for colour. The first layer of colour is sometimes just a sacrificial coat. 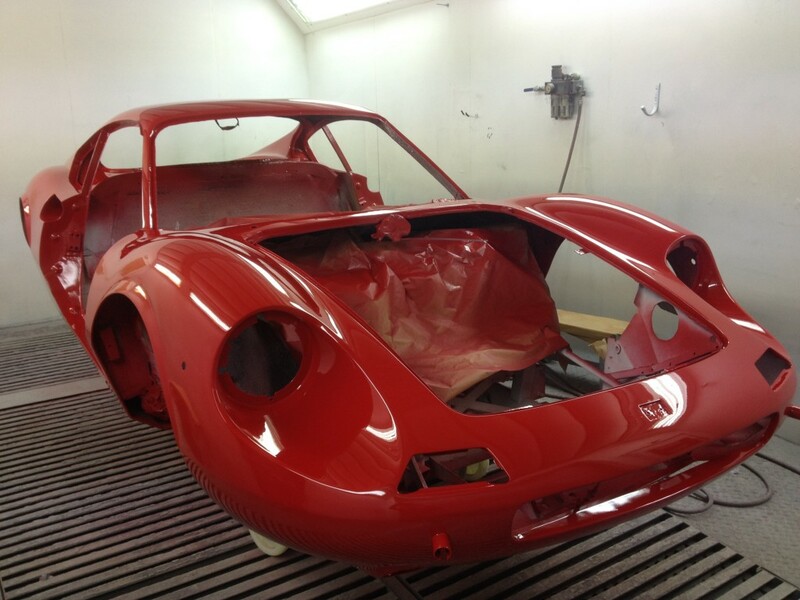 With a coating of coloured paint on a body shell you can see if anything does not look right. 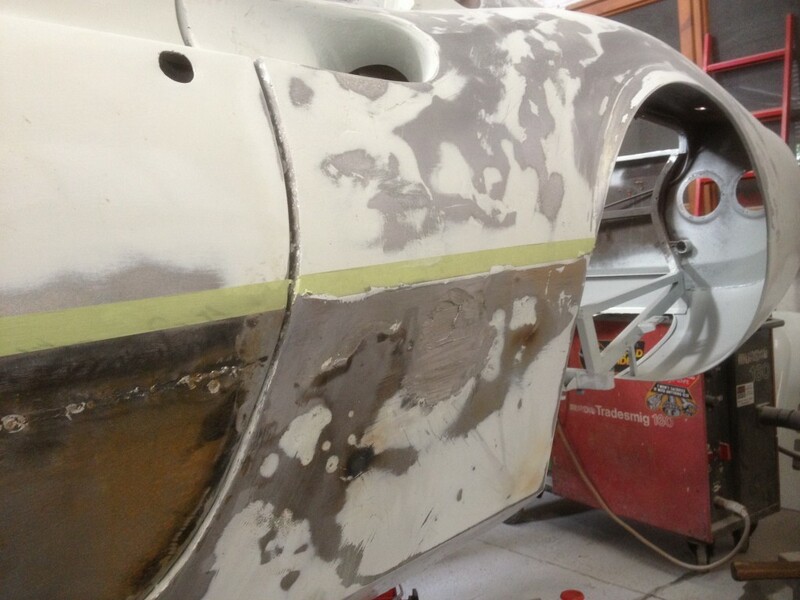 If the body is a good shape next the paint is checked for imperfections in the way it has been laid down (odd textures – signs of sanding marks – contaminates). The Dino looked good but we gave it a colour sanding away just to be sure. 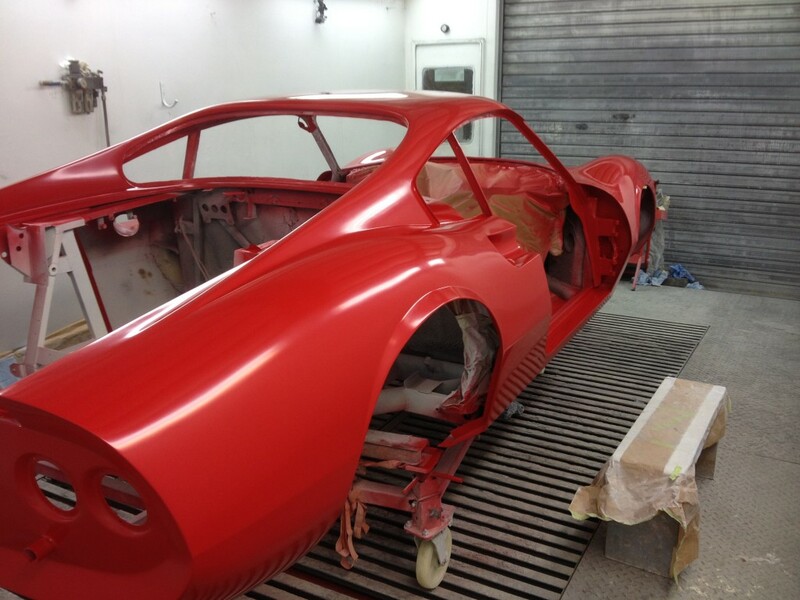 To achieve the high quality finish a Ferrari deserves the clear coat needs to be flat and polished all over to remove any trace of the orange peel effect seen on so many standard paint jobs and with the complexity of the shapes this would be a long careful process. 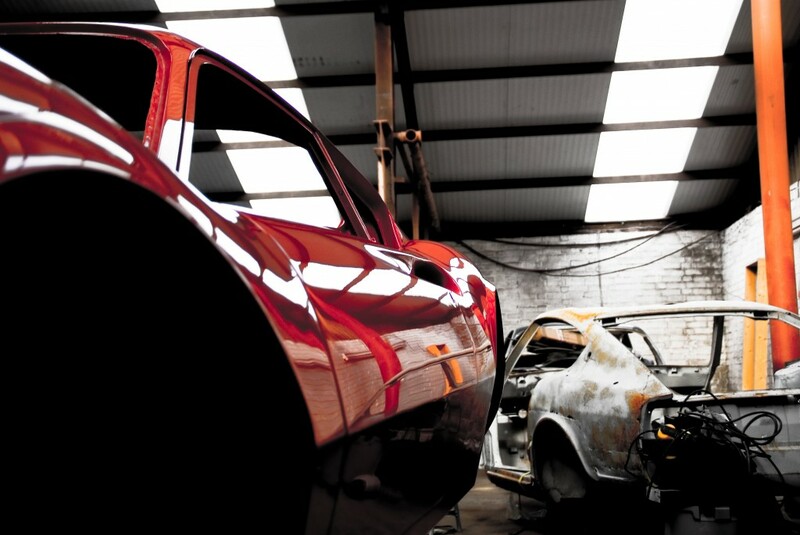 Working one area to heavily could result in an entire respray as there are no panel edges and and a blow in may show when the car is re-polished. Before we started the flat and polish ( colour sanding ) there was some black detailing that had to be added. 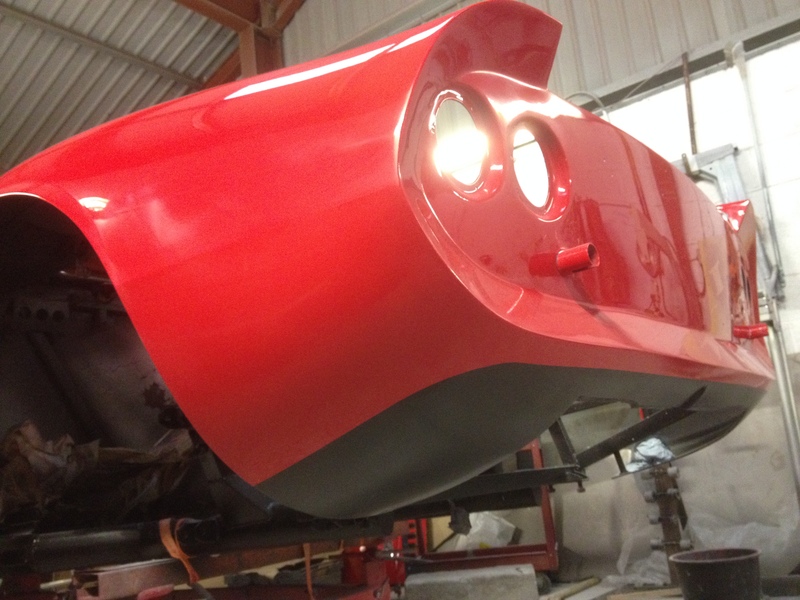 The Chassis need to be epoxy painted the inner wings required a manufacturer period style protection coating and the lower sills, compartment shuts and engine lids undersides all required satin black paint to match the original style. 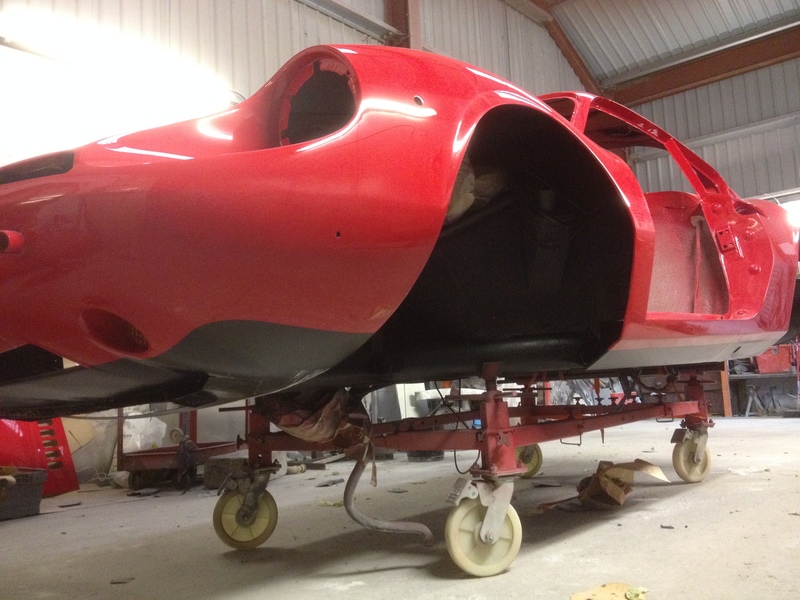 THE FINISHED FERRARI DINO BODYSHELL painted and polished and ready to go back for refitting.